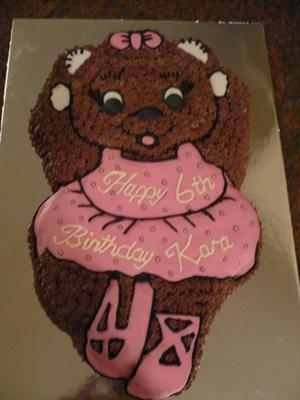 To make this ballerina bear birthday cake, I used the Wilton Bear-shaped tin and looked at the Wilton web site for information on how to decorate the cake. I decided to use fondant icing for the dress, shoes, bow and eyes, and piped the brown chocolate icing for the fur. This was my first attempt at piping, but it surprisingly turned out ok. To get the fondant icing in the shape of the dress and shoes, I pressed it into the cake tin and trimmed off any excess. Then I carefully peeled the icing away and placed it onto the cake. I also used those little silver balls for decorating the dress. Very cute!!!! You did another fantastic job !!!! Join in and write your own page! It's easy to do. How? Simply click here to return to Ballerina Cake.